So you fancy yourself a breakfast connoisseur, do you? Well, now we’ve found you out, we dare you to try every meal on our best breakfasts on the Sunshine Coast list, before we all say sayonara to 2015. Think you can handle it? 1. There are big breakfasts, then there’s the Hunters Breakfast—the gourmet version served up at The Velo Project. If you don’t want every other big breakfast from here on out to taste like, well crap, then we suggest you steer away from this piled up piece of slate featuring deliciously meaty ham of the bone, pork and sage sausage, mushies (the roasted garlic kind, fool! ), grilled haloumi, toasted ciabatta, and a sweet tomato chutney. We’ve probably left some bits out, but if we haven’t sold you yet, we’ve got no chance. 2. Rewind to pre-2014 and finding an acai bowl on a Sunshine Coast breakfast menu was pretty much unheard of. Hell, we didn’t even know how to say the word. Ak-eye? No, that’s not right, is it? Anyhoo, the point of the matter is, now they’re everywhere. Which means finding the best, is berry serious business. But we reckon we’ve narrowed it down, and if you want to lose your acai bowl virginity before the year is out, we reckon you get down to business with Decisions Café’s Acai Bowl—a seductive mix of granola, seasonal fruit, mixed seeds, and coconut flakes. Mmm-hmm! One of the healthiest options featured on our 2015 list of the best breakfasts on the Sunshine Coast. 3. We’re big lovers of anything Middle Eastern and that’s why Hand of Fatima is one of our fave Sunshine Coast cafes when it comes to dishing up delicious ethnic cuisine. With an ever-changing menu (we’ve had affairs with both the baked eggs and the tasting plate), we won’t tell you to order one specific breakfast, because if we’re honest, any will do the trick. 4. If you like things a little bit fancy, a whole lot creative, and served at a level that you can rave about to your fellow foodie comrades, get you and your stomach to Gainsbourg in the AM. Being risky at this Mooloolaba cafe pays off, so order the breakfast plate of perfectly stacked house-smoked trout, potato & quinoa hash, absinth-buttered kale, poached eggs, and a generous drizzle of hollandaise. Our mouths are watering just talking about it! 5. If you’ve been to France and fallen hard for Croque Madame, chances are you’ve tried and failed to find somewhere that makes it at least half as good as our froggy friends. That’s about to change, ‘cause we’re going to let you in on a little secret… Elliotts Bistro do a cracking copy. Don’t walk into 2016 without trying this béchamel, fried egg, and smoked ham combo. Or else! 6. Little Boat is all about getting adventurous, and that’s why we’re telling you to get down there and stretch your waffle history to include ricotta waffles topped with grilled banana, roasted macadamias, a dollop of organic honey labneh, and then drizzled in chai syrup. So different, so good. 7. Oh stop it, you paleo peeps, you! We were always going to get to you! We’ve got the ultimate Sunshine Coast breakfast for your kind to devour before the year’s out. Head to The Shak in Buderim and get acquainted with The Gatherer—a good-for-you dish of sautéed leaves and herbs, mushrooms, honey roast pumpkin, avo, quinoa, and a poached egg, topped off with a tamari, and ginger dressing. Are you happy now? 8. When was the last time you visited Palmwoods? Wait, don’t answer that! We’re just going to give you one good reason why you’ve got to get there stat! 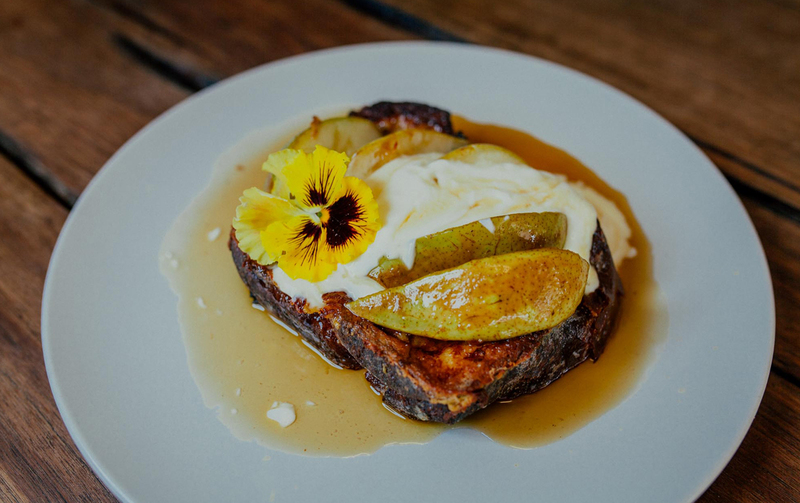 It starts with Homegrown Café and ends with a stomach full of French toast, pear and yoghurt, and lips sticky from syrup. Get the picture? Want more inspo when it comes to the best breakfasts on the Sunshine Coast? Check this out!